Southworth Sailor: Coming out of the closet! After spending twelve years under the stairs in a closet, my theological library finally gets a new home -a nice home at that, with a view of the Puget Sound and plenty of light. 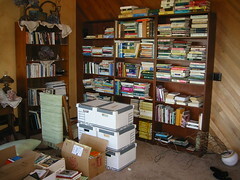 Twelve years ago I resigned the pastorate and all of my theological and biblical books had to come off the study shelves and into boxes. There was not enough shelf space or room for them. Now in our new house, there is plenty of space for my books. We bought some bookshelves at IKEA and put them on one side of our gigantic bedroom. I am discarding about one fourth of my books since there is still limited shelf space. I still need to straighten them up, but I'm letting them get climatized for a couple of days.